Eloquent Resin and Stone Mix Photo Frame holds a 5" x 7" photo. 10.5" vertical frame. Literary caption: This day I will marry my friend, the one I laugh with, live for, dream with, love. 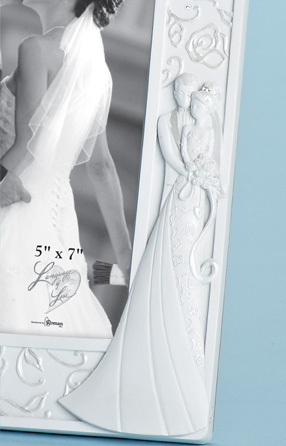 Display your favorite wedding photo in this beautiful 5x7 frame. It features a pierced rose at the top and a sculpted bride & groom at the bottom. 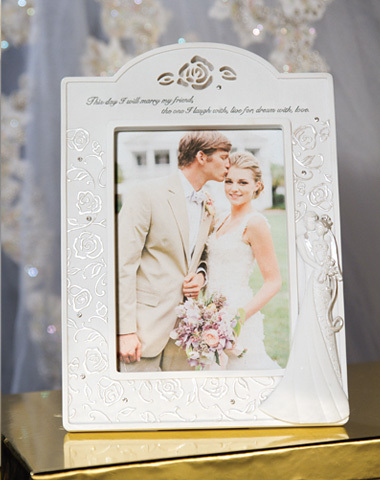 This frame also makes a lovely wedding gift!